FarlaVale Gundogs - A creative approach to producing a complete modern day Gundog. We are proudly sponsored by VetSpec - a Veterinary Specification dog food, Damson Tree Vodka and Keepers Sausage. Please click on the logo's to find out more. FarlaVale Gundogs is a family run business with an appreciation for all breeds of gundog. Ryan Kay is a Kennel Club Accredited Instructor for Working Dogs and has been involved with gundogs since a child - brought up working his father’s Labradors and Cockers on a small shoot in North Yorkshire. We are now based in a small hamlet on the outskirts of York. We like a challenge, and our last 2 HPR’s have both been ‘rescues’. Our rescue Vizsla Molly became the Top Field Trialling Vizsla in the country (most Points accumulated ) for the 2013-2014 season. For this she was awarded the Janos Field Trial Trophy by the Vizsla Society. We believe in a flexible and creative approach to all our gundogs and also for those dogs that come to us for one to one training. Many handlers arrive with a problem to be solved and one which may require different methodology. We will listen to your requirements, and work with you to achieve your Aspirations. FTCH Broadmeafarm Charlie is a strong and well-presented medium sized cocker, furnished with handsome looks and a wonderful temperament. Charlie is a tireless hunter with impeccable working lines. We offer one to one training rather than group sessions. Lessons last up to one and a half hours depending on the dog’s stamina and its ability to stay focused. Whatever the outcome, you’ll go away with a headful of information and plenty of training methods and exercises to work through. Our preferred approach is to equip owners with the techniques and skills that will build their confidence as a handler and help shape a partnership with their dogs. Ryan is also a gundog correspondent for ‘Sporting Shooter’ magazine, contributing on a monthly basis with stories from the field. 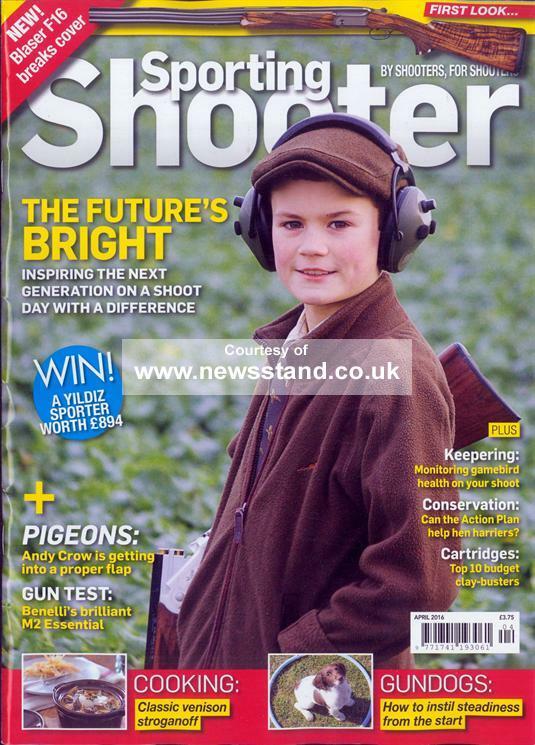 Pictured above is his son, Fred, on the cover - also a keen young shooter.